The postman's been busy bringing packages to the condo with my name on it. They've been just as busy NOT bringing packages. It seems for every one I get, they lose one. This just hisses me off to no end. I did receive my prize from Dana Pixie from #Jackspawty on Twitter and my replacement package from Christina of Peace Love & Whiskers. It hisses me off that she HAD to send a replacement package since this was an item I'd won in the auction she held for charity. All the money I donated was spent on postage. That does NOT make the kitteh happy. My next topic involves TW's FB page. Unbeknownst to myself, she posted lies about my eating habits. I've been eating just fine lately. For the past three days, I've drank all the pumpkin soup out of my grain-free Soulistic. I binge and I purge. So what? Actually, I don't actually purge; rather I fast. As you can see, the peeps just ordered my food and the cabinet is as full as it's ever been. That means I can be picky. When there's only 1 box of each left, TW mentions that she might not order it again cos it's a waste of money and food. Then, until she DOES order it, I wolf it down like it's my fave food in the world. Then she reorders and I won't touch it. I'm a Cat in good standing. Concats to Kevin aka Meowmeowmans and I couldn't be happier for him. Mommy says my eating habits are much the same. Picky, picky, picky, then eat like there's no tomorrow. She says she never knows which it will be. I say keep em guessin! Paws up for the PAWS kitties! And CK, I have honed my eating habits to a fine art - my human NEVER knows what I am going to eat and what I am going to hate anymore! Ah CK, you are indeed a cat in good standing. Congratulations to Animal shelter volunteer life! No picky eaters here as we are both gobblers LOL. Congratulations to the winner. It is OK to be fussy CK. That is what cats do. Congrats to Kevin on winning that good food. Hope all of you have a great day. Take care. I'm picky too sweetie. Congratulations to the winner of your contest. Yay for Kevin that is a pawsome win! And your cabinet looks nice a full CK! Yeah, we're so glad kevin and the kitties won the food. Completely normal and acceptable behaviour I would say. But OMC the amount of food!! You are one lucky cat! I have never seen as much food at once!! conga ratz moosey N crew on de awesum prize oh foodz !! Concatluations to Kevin! Woot! All the kitties at PAWS will have yummy food! The Squeedunk cats love it when there are packages for us. We don't think it happens often enough, though. 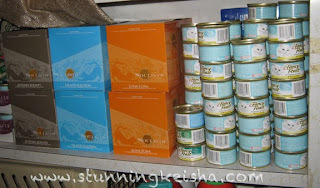 Concats to EVERYONE including you...don't you just love looking at all that beautiful food on the shelves? You can relax now and not have to go on food patrol for a good long time CK. I agree, it is okay to be picky. With 7 of us we each take a day, but not the same day. That really confuses our Dad! Sheesh...silly beans...if they had to eat the same thing efurryday wouldn't they be fussy too? Keep 'em guessing, MOL! Concats to you on your wins, concats to the Kevin and his crew, and hiss to the postman! Food in the mail, what will they think of next? Mice in the mail? Hey, CK. It's a cat's right to be picky. That's what makes us cats. Doesn't TW know this by now?? And congrats to Kevin. 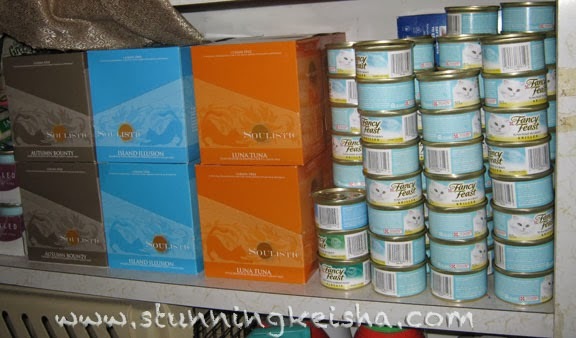 We're sure the shelter kitties will love that food. All right, darling, I confess: I am not usually all THAT happy when other kitties win prizes. So sue me. But I am THRILLED that Animal Shelter Volunteer Life winned this prize. They are just the BEST! I am almost as good as you at making my Human sorry she went out and stocked up on my "favorites" heh heh. See you later. Hey its in the kitty handbook we each get picky sometimes. Concats to PAWs that is going to be great for them. Wow CK that is a lot of delicious noms! That would make me angry about the postman too... I don't think I've lost any packages yet so they must be doing an OK job. And concats to Kevin and his crew! Good job on getting that cabinet all stocked. You are a master kitty, indeed! Hugs to you, TW and Pop. Don't let Waffles see that photo of your cabinet. I fear that even his lack of thumbs won't stop him from raiding the stash. 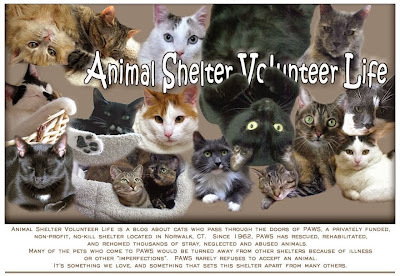 Big congrats to Animal Shelter Volunteer Life! So much food you have in your cabbinet ! Can you beleive that my mom-person say´s that I´m picky too when it comes to wetfood ?! Are You A Ghetto Cat?